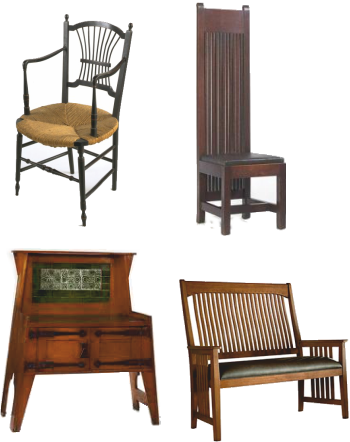 The Arts and Crafts Movement was one of the most influential design movements of all. During the industrial revolution, skilled craftsmen saw the increased use of machines, replacing their skills. Before the industrial revolution, craftsmen trained for many years, perfecting their skills and this was reflected in the products they made. The industrial revolution changed all this. Members of the Arts and Crafts Movement, saw the industrial revolution removing craft skills from the manufacturing process, making workers less creative. William Morris (1843 - 1896) was one of the leaders of the Arts and Crafts Movement. He said, ‘We do not reject the machine, we welcome it. But we would desire to see it mastered’. His company Morris, Marshall, Faulkner and Co, manufactured a range of products including furniture, wallpaper, stain glass and even carpets. These were all handcrafted with the use of machines rejected. 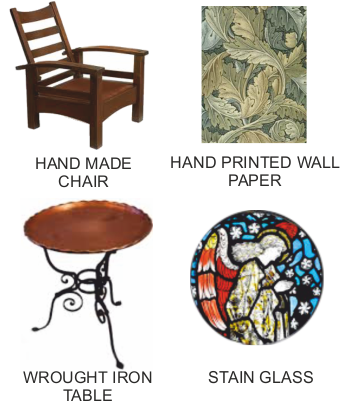 The Arts and Crafts Movement believed in social and economic reform, supporting skilled workers.